With the proliferation of the elevator, taking the stairs has become an after thought to many an office workers daily activities. Little do they know what great mini-workouts they are missing. Stair machines aim to simulate the physical exertion required to scale these little beasts. The machine itself works on a very simple principle, similar to that of an escalator. The stairs are on a rotating tread allowing them to be cycled around and around somewhat creating an endless stair case effect. This allows the user to continuously climb without interruption. To the sides of the stairs are safety rails which should be used sparingly as by turning the arms into support features, they put a damper on the workout itself. Climbing stairs is easily overlooked by many as a great form of exercise that can truly be performed just about anywhere. Incorporating muscle groups like the calves, buttocks, and quads, stair machines require the user to fight against the pull of gravity as well as having to propel themselves forward through foot movement, similar to how a treadmill works when utilizing the incline feature. 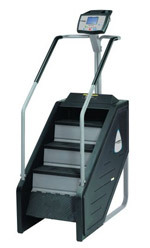 General usage of the stair machine involves taking one's foot and stepping upward with the toe pointed straight. To mix things up, one can take more of a plyometric approach. By performing the exercise with the feet perpendicular to the machine, one can engage the hips (abductors) and the inner thighs (adductors). One should perform this variation in equal time increments, facing both sides of the machine. Caution should be taken while performing the exercise this way, if one feels unsafe while performing, use the safety bar which would be directly in front (since the body is turned) for added support. With one's feet perpendicular to the machine, a crossover technique may also be used in which on each alternating step, the feet swap which side is in the lead meaning: the left foot will crossover in front of the right foot, the right foot is brought up to the next step, then while bringing the left foot up, it will cross behind the right foot, alternating throughout the session. This machine may also be performed backwards. Extreme caution should be exercised while utilizing the machine in this fashion. The goal of this variation is to place more emphasis on the hamstrings. It does this by requiring the hamstrings to fire and lift the legs onto the next step as opposed to quads. The buttocks are slightly more targeted in this variation compared to the traditional use as well.